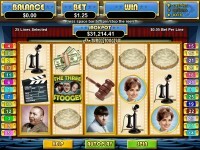 The Three Stooges is a fixed bet 5-reel slot found at RTG online casinos. 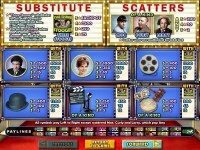 This slot features 25 paylines, wild symbols, and three different bonus features. Each spin is fixed at 25 paylines and 5 cents per line, for a total bet of $1.25 per spin. The Three Stooges symbol is wild and substitutes for all symbols except for the scatters. The prize is tripled when the wild substitutes in a winning combination, and if you line up 5 on a payline, you win the progressive jackpot. Larry, Curly, and Moe are the scatter symbols. If three matching symbols land anywhere on the reels during a spin, that character’s bonus feature is triggered. 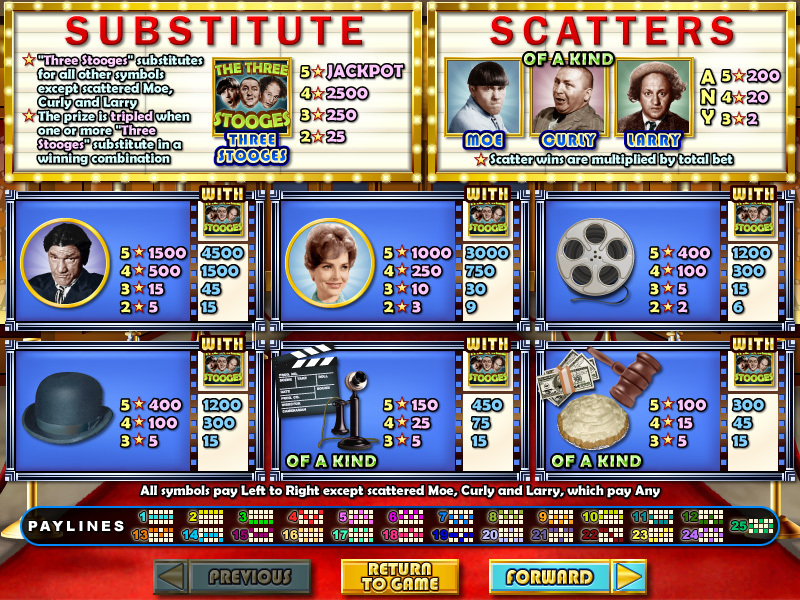 The Larry’s Loot Feature is triggered when three or more scattered Larry Symbols land on the reels during a spin. Click on each of the triggering symbols to reveal prizes of up to 1000x your bet! The Curly Cash Feature is triggered when three or more scattered Curly symbols land on the reels. You are awarded 10, 20, or 30 free spins if 3, 4, or 5 scatters trigger the feature. All prizes are tripled during free spins, except for the progressive jackpot, and more free spins can be won. 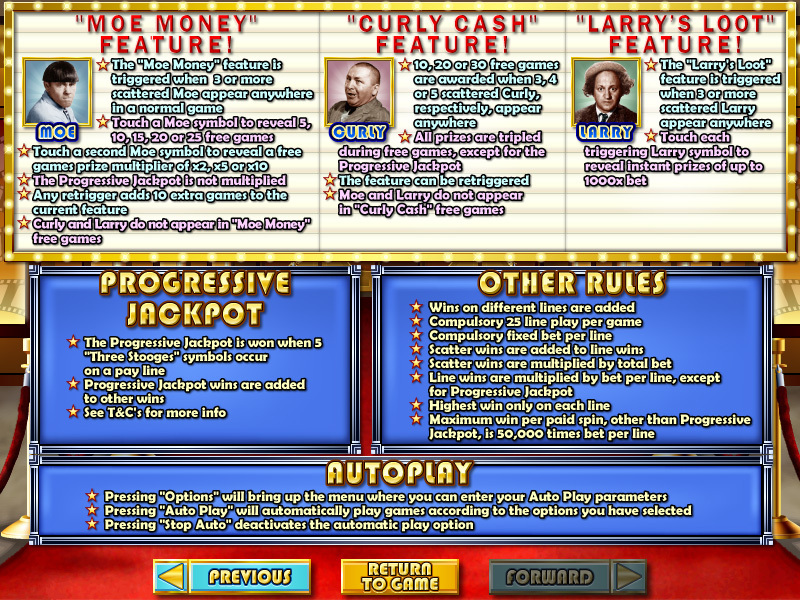 The Larry and Moe symbols do not appear during free spins. The Moe Money Feature is triggered when three or more scattered Moe symbols land on the reels during a spin. Select a Moe to reveal 5, 10, 15, 20, or 25 free spins, then select a second one to reveal the multiplier of x2, x5, or x10 for those free spins. 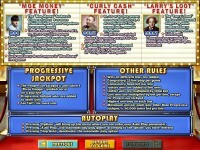 Larry and Curly do not appear during free spins, but if three or more Moe symbols land, 10 more free spins are awarded. I don’t play this slot very often when I’m playing at an RTG casino. I don’t know if it’s just my bad luck, but The Three Stooges have never been good to me. I don’t know if having three features with three different triggering symbols makes it more difficult to hit one of them, but I have a hard time getting three of the same Stooges to land on the reels. That being said, you have the same chances of winning on this slot as you do on all the others with various amounts of features and bonus symbols, so it’s probably just my luck. See the screenshots below for paytable information. 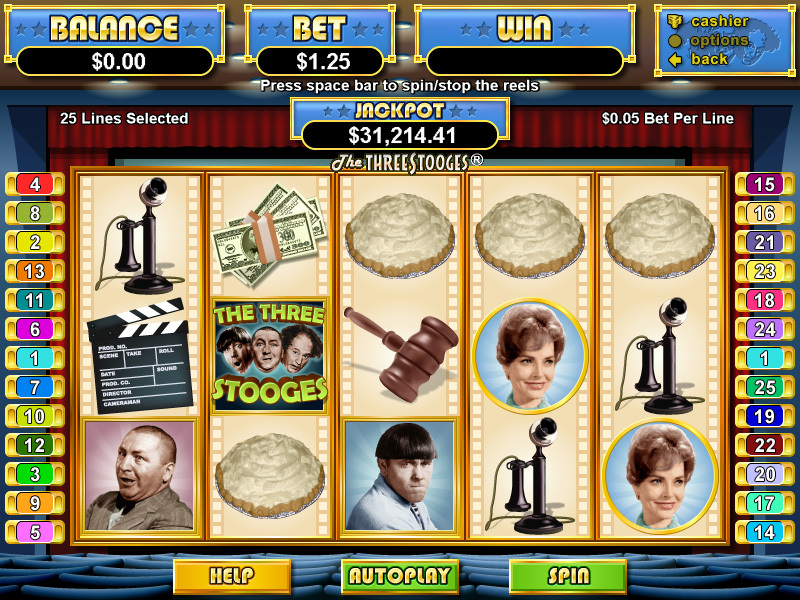 Play The Three Stooges now at these RTG Casinos.